I’ve had this blog up for a few months now and I can’t believe I’ve made my readers wait this long for a kitchari recipe! When most people think of Ayurveda, the first thing that comes to mind is kitchari. And if you’re familiar with kitchari, you’ve probably heard all about resetting your system through a kitchari cleanse, where you eat kitchari morning, noon, and evening, for a specified number of days. While this recipe isn’t written for a cleanse per say, the ingredients can be adjusted as per your cleanse requirements (e-mail me for specific adjustments), and if you aren’t doing a cleanse, this kitchari makes for a great breakfast, lunch, or dinner on any given day. Packed with flavor, you’ll be reaching for seconds and thirds without the guilt. The basic components that go into a kitchari are split moong dal and rice. The ratio of lentil to rice varies depending on the recipe, but I usually like to go for a 2:1 rice to lentil ratio. To this we add turmeric, which is revered for its anti-fungal, anti-viral, and anti-inflammatory properties and more. Other spices (including salt) are optional, as are veggies, onions, ginger, and garlic. I like to changes up the spices and veggies seasonally, so keep an eye out for more kitchari recipes as the seasons change. I have a lot of tricks up my sleeve! Take the rice and moong dal in a large pot. Rinse thoroughly and drain. Add 4 cups of water, 1 tsp salt, ½ tsp turmeric powder. Bring to a boil over medium heat, then lower the heat to med-low. Allow to simmer until the rice and dal are fully cooked adding more water as needed. The moong dal should be soft and mushy when it is completely cooked. While the rice and dal are cooking, heat the oil in a large sauté pan over medium heat. When the oil is hot, add the cumin seeds and allow to sizzle being careful not to burn them. Add the onions and sauté until they are translucent. Add the ginger and sauté for a couple more minutes, making sure the ginger doesn’t stick and burn. Add the remaining ¼ tsp of turmeric powder along with the cumin and coriander powders, and the shredded coconut. Roast until the spices release their flavors. Mix in the zucchini and yellow squash cubes and coat thoroughly with the masala (spice mixture). Cover with a lid, reduce the heat to med-low, and allow to cook until the squashes are soft. Take the cooked zucchini and yellow squash and stir it into the rice and dal. Mix in the chopped cilantro and lime juice, adding more salt if needed. Enjoy warm! Rice and moong dal are easily digested by the body and are eaten during times of illness and recovery. Rice is heavy and sweet, and moong dal is light and nutty making it a combination that is perfect for all the doshas. Zucchini is heavy and grounding for Vata and is cooling for Pitta. 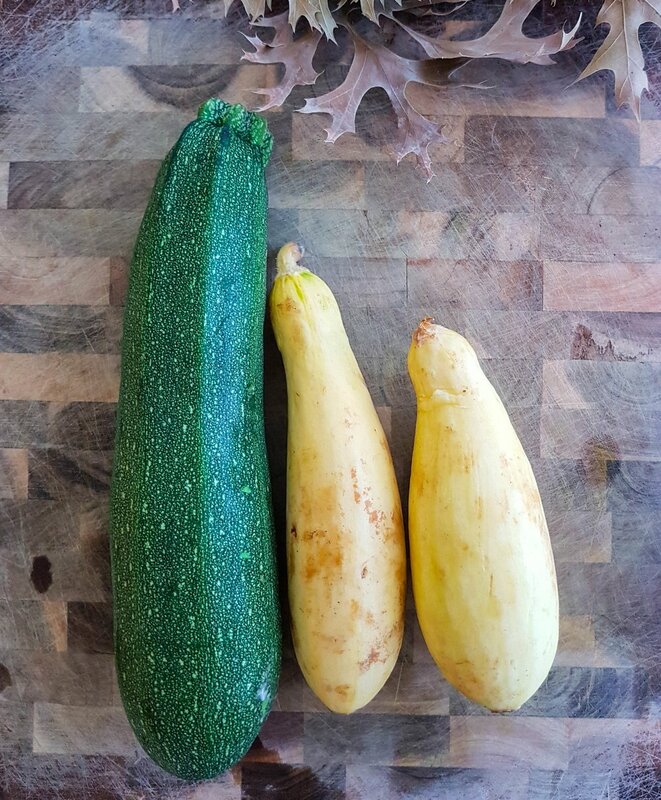 Use ½ a zucchini and yellow squash to reduce the amount of water you add to your system. Also, add ¼ tsp black pepper while cooking the squashes to add a little heat to the kitchari.